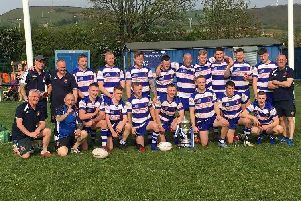 Siddal secured a second successive National Conference Premier Division home win against opponents from Humberside with a thoroughly dominant 40-2 hammering of West Hull, a performance that saw them restrict the 2013 and 2014 Grand Final winners to just a sixth minute penalty goal. By the 23rd minute, Siddal had scored three converted tries to take an 18-2 lead and West Hull were already facing an uphill battle. The current champions were simply too strong and too fast as they enjoyed playing in near perfect conditions. Powerful surges by props Iain Davies and Jack Georgiou had West Hull back pedalling and quick plays allowed halfbacks Kyle Ackroyd and Shaun Garrod to spread the ball wide and stretch the opponents defensive line. The right centre and wing pairing, Ben West and Joe Martin, were first to capitalise with tries in the 10th and 18th minute respectively. Left wing Gareth Blackburn added two superb conversions to put Siddal 12-2 in front. Dominating possession Siddal threatened every time they had the ball and it was no surprise when strong running second row Tom Garratt powered over for Siddal’s third try in the 22nd minute. Blackburn again added the conversion and half time arrived with the home side lead 18-2. The second half followed the same pattern as the first. Siddal extended their lead in the 52 minute when a high bomb by Ackroyd was allowed to bounce by the West Hull fullback and the chasing West enjoyed a fortunate bounce and ran behind the posts to score his second try. Blackburn added the easy goal. Within three minutes, Siddal had returned the restart all the way back upfield and Blackburn was scoring his first try of the afternoon, Siddal’s fifth, with a superb finish right on the left corner flag after Garrod had thrown a long pass out to the winger. The same player fired over his fifth conversion from the touchline to push Siddal out to a 30-2 score. Sean McCormack was cutting the West Hull midfield defence to ribbons from dummy half and one break led to the supporting Martin adding his second try just before the hour mark and with another Blackburn goal, Siddal were out of sight. Garrod fired out a long pass to Blackburn who repeated his first finish by again using the corner flag to get the ball down in the corner. The free scoring winger couldn’t quite convert again from the touchline but a 20 point haul for the England Lions winger represented a great afternoon’s work. There was no further scoring in the final 10 minutes though centre Zack McComb came close twice, just being denied right on the line by scrambling defence. Siddal now look forward to next week’s 2016 Grand Final repeat against Leigh Miners at their home base, CWC Park. Freddie Walker was outstanding for Siddal and Blackburn is in great form, while up front young forwards Georgiou, Matthews and Smithies are following the lead set by the more experienced Smith, Sanderson and McCormack.